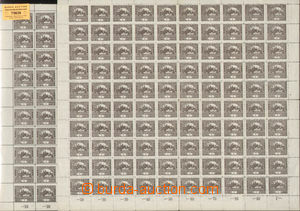 Pof.7D STp/I.s,15h, horizontal pair, line perforation 11½;, plate 1, pos. 22+23, joined bar types on stmp with T I. spiral, rare, exp. by Karasek.., Škaloud. Pof.7E Is, 15h open spiral, line perforation 11½:10¾;, pos. 83/I., marked, light hinged, exp 2x Lešetický. 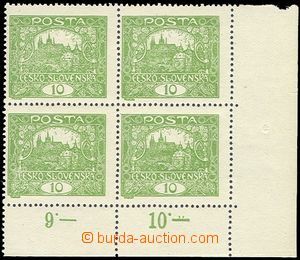 + St.
Pof.7G IIp, 15h, line perforation 11½:13¾;, plate 1, pos. 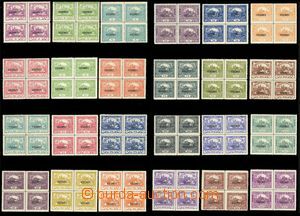 16, bar subtype, lightly hinged, exp. by Mrnak.., Karasek. 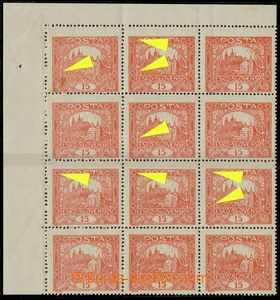 Pof.11D,STp, 25h violet, block of four, line perforation 11½;, plate 1, pos. 86, joined types bar, nice, expert Benes.., Karasek.